Winter, while not considered the driest season in Chinese Medicine (that designation belongs to Fall), tends to promote dryness from the cold winds we are exposed to, and the dry heat from fireplaces, radiators, and forced hot air heat. Many people come to me at this time of the year with stubborn dry hacking coughs that are often worse in the evenings while trying to sleep. Additionally, upper respiratory infections including common colds, and viral and bacterial bronchitis and pneumonia, often end up with a dry cough at the tail end, which lingers. Most upper respiratory infections, especially if they involve fevers, end up depleting fluids and “yin” the nourishing moistening influence in the body. So, one great way to help improve this irritated, agitated, dry, yin deficient condition happens to be a wonderfully delicious tasting concoction. Both pears and honey have a long history of use as both food sources and healing foods. It is certainly not uncommon to use honey in tea when sick as a soothing aid, and much study has been done on the antibacterial properties of raw honey, especially manuka honey. 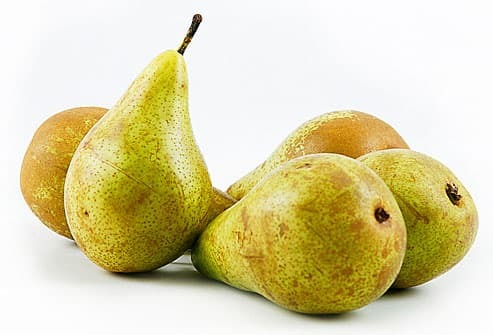 Pears in Chinese Medicine are useful in restoring moisture and yin in the lungs and the throat. The following is one of the ways in which you can help to manage a dry hacking cough in your own kitchen from common ingredients. While still warm stir in honey and have a small serving two to three times a day at room temperature or warmed. This should help a lot within two days but if the cough continues you might try acupuncture with a skilled practitioner (who may also utilize Chinese Herbs), momordica (luo han kuo) tea (found in Chinese markets), or honey loquat syrup (found in health food stores). May your New Year be blessed with health and happiness!